This week's MOTW comes from the beloved Travin. Not seen for some time but still a favorite in the map making community. 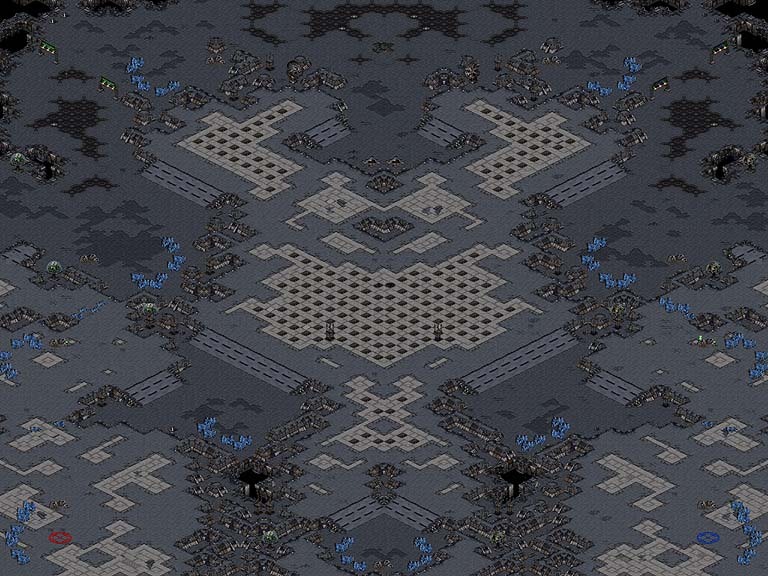 (4)Behemoth1.1 has a simple yet interesting layout which shows promise in any type of game. With a backdoor at each main that leads to a gas expo, it is sure to promote fun and interesting strategies. This is the first map that Travin uploaded here at broodwarmaps.net, showing that the old school maps still have the kick to take a MOTW crown. (4)Behemoth1.1 takes MOTW.27 with grace and old school style! Determing the 50th MOTW map on BWMN since we started wasn't easy, as three maps had almost the equal number of votes: LGI's Osom, flothefreak's Origo_Hills and Listoric' Unholy Gods. I dicided to give the award to Origo Hills. 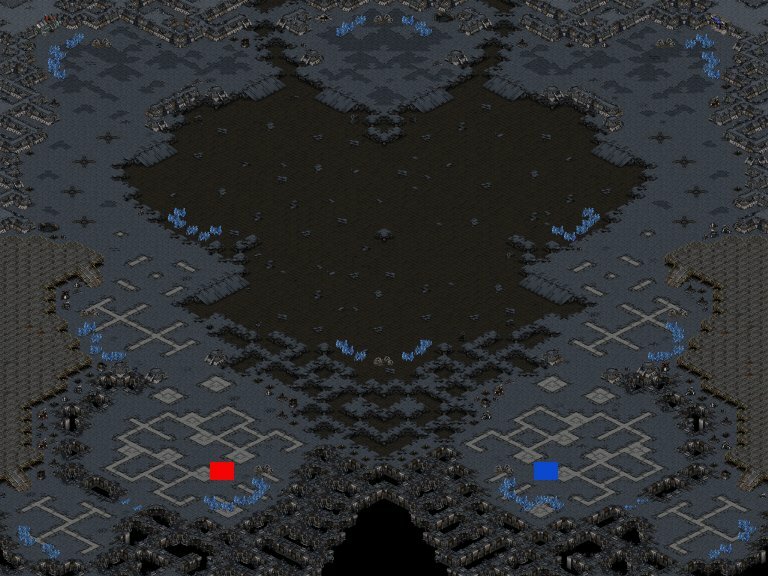 Many players might already know it from BWMN pack 1 and some showmatches, but the map changed a lot since. 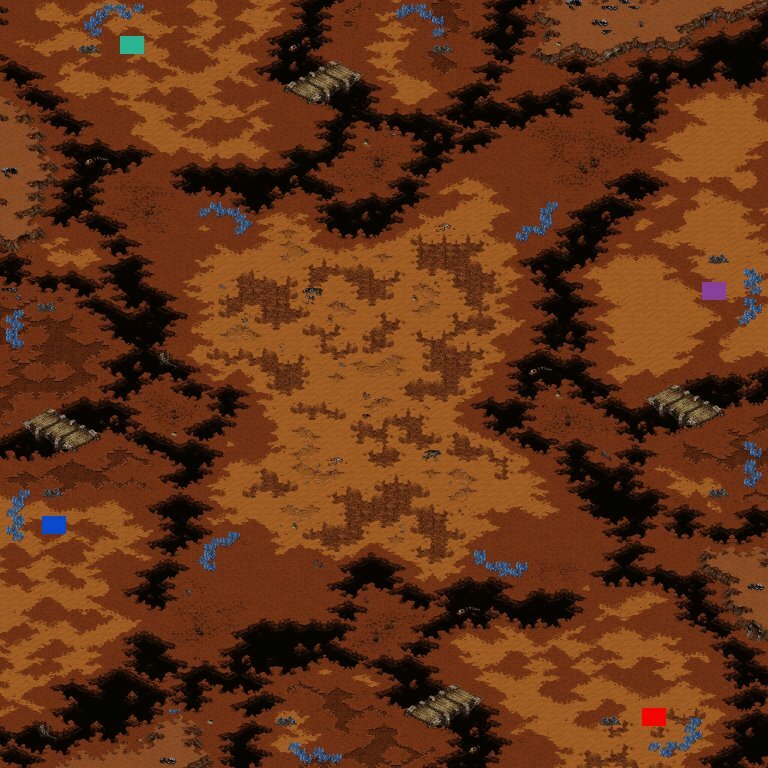 flothefreak decided to get rid of the small mainbases to change the map to a more proven layout. The nice custom ramps, that even in the middle of 2006 still look quite spectecular, and the "hidden" mineral expos are elements we already know from the first versions. In austria, they really have a sign for that: A "Geisterfahrer" is someone who drives on the wrong side of the road. Noname, who is known for putting up ramps the "wrong" way too, cruised to his fourth MOTW award with an uncontested win for (2)geisterfahrer. The natural expansion on the map looks pretty easy to secure, it is in the middle where many of the fights should happen. The pretty big amount of expansions overall makes up a bit for the fact that the first ones are easy to get to weaken terran a bit. The decoration and style on this map is real noname-quality, and of course he used some custom ramps again. It's been a while since we have last seen Antares in the MOTW thread, but he's back to claim his second MOTW. We take a break from the more common 128x128 maps to bring you: (2)Gravity by Antares. What sets this map apart from others is its compilement of many great concepts into one great map. The backdoor/mineral only expansion really stands out, as well as the unique low platform center. Due to the expansion layout and decorative flare, this map and its potential gameplay is certainly what one would consider "dynamic". With it's high appeal, and unique layout (2)Gravity is bound to provide us with some interesting matches. This week's MOTW is a co-op from NastyMarine and Arden(WoF), two hungry young mappers from america. (2)Battle Grounds features HUGE main bases, which makes the natural expansion more exposed than on other cross-position 2-player maps. The way the natural can be attacked backdoor reminds me of Gaia.